Because it is February - which is hard to spell - and I am at a bit of a loss with regards to subject matter, I am going to jump among a bunch of random subjects, factoids and I-didn't-know-thats. Its an ink-blot post, kind of a free-form stream of consciousness. If I get off track it's only because I never had one to start with. It hit 17 degrees today and believe me that is a good thing. Tomorrow's bringing 33 degrees to my neighborhood. More good. Three doors down they're digging up a water lateral that froze. The city is encouraging people to turn their cold water on for 5 minutes at a crack, 5 times a day to avoid freezing your lateral. Drain what little aquifer we have left in Waukesha in the name of flowing laterals. Another Valentines Day is looming in a couple of days. I'm glad I married a woman who most years says "No $4.00 Hallmark Cards!" Most years we take the money we spend on cards and put it towards take out pizza. That's not just love, that's long-standing love. I was inducted into the Torrid Literature Journal Hall of Fame this week. It is specific to that particular magazine, and was determined by online voting. I had poetry published in two issues of their magazine last year, so it was a nice honor. From the mouth of my wife: "I would just like to turn on a light switch without getting a shock. Is that too much to ask?" One of the few bright spots of this February are the Olympics. I enjoy them every night and I'll admit, I do watch the women and pairs figure skating. Amazing athletes. Along those lines, I've never seen slopestyle skiing before, but those people are nuts. Last night I saw a woman go off a jump backward and landed backward. I can't even imagine the guy who said, "Maybe we could make them go off the jump backward!" Worse, I picture his cronie judge-types cackling and saying, "Yeah, boss, and then we make 'em land backward too!" One of the highlights of my week is the hour I spend with three other guys on Thursday mornings at Cafe De Arts. We talk about everything under the sun. It was started under the auspices of a book study and still is, but our subjects wander from gay marriage, to Biblical stories, to appliance repair, to the latest cool iPad app, to how to make a book trailer, to what's wrong/right with the church today to the new Pope, to our family lives, to work issues to, well, you get the idea. It is strong talk fueled by Waukesha's best coffee. I originally dismissed my first invitation to be with this group, but when I was invited a second time, I started going. I'm glad I did. Tomorrow and Friday I'll be with 300 other map geeks from around Wisconsin at the WI Land Information Association. Old friends, some new friends and lots of technospeak. Good times and invaluable networking and sessions. My story Phantom Camp about a zombie Sasquatch was accepted for online publishing by the Free Zombie Fiction Blog. It was a story inspired on my last trip to the BWCA. I'm glad it found a home. Look for it in March. The downhill event can best be summed up by a friend of mine who said one downhill race holds more excitement than every baseball game I've seen combined. I tend to agree - no disrespect to baseball fans. It takes a special kind of crazy. To keep me humble, I've had two rejections in the past week for fiction and poetry. It's not all wine and roses. I saw this picture on Facebook and it cracked me up. Cracks me up every time I see it. 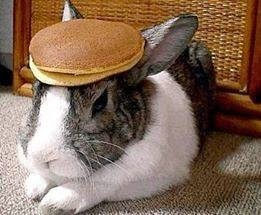 Nothing brightens a February day like a rabbit with pancakes on its head. So that's about it. A little of everything. The voices in my head. Sometimes I'd like to squelch them, other times they just get drowned out by the tinnitus.